Shares of profits in national incomes are soaring; those of wages are falling. It’s a recipe for corrosive and creeping deflation. The share of operating surplus in the value added by U.S. non-financial companies – out of which providers of debt and equity earn their incomes – has reached a 47-year high of 23 percent. It was less than 15 percent in 2002. The share of wages has fallen since then: from 62 to 56 percent of value added. The pattern is not exclusively American. Wage shares in national income have fallen over the past two decades in 26 out of 30 developed countries, according to the OECD. This state of affairs is problematic on many counts, including its potential to spring a Japanese-style deflationary trap. A shrinking share of wages in national incomes means any upward pressure on prices will be muted, and much faster GDP growth is needed before inflation starts to accelerate. Indeed, the things that go into personal consumption in the United States are becoming costlier at a tepid 0.9 percent annual pace, less than half the 2 percent rate the Federal Reserve wants. Core inflation is more anaemic in the euro zone. Even in fast-growing Asia, price pressures are largely absent outside of India and Indonesia, both economies where supply is quite constrained. If faster world GDP growth doesn’t materialize quickly, global deflation is a real risk. Karl Marx prophesied a different outcome. The 19th century German philosopher had posited that opportunities for earning a return on capital higher than its cost will get rarer as more money is sunk into machines and factories. Eventually, returns will exhibit a “tendency to fall,” bringing capitalism to an end. But the return on capital, measured as the ratio of the operating surpluses to non-financial assets, stands at 9.4 percent, almost one standard deviation higher than the average since 1960. By propping up corporate profitability, high profit shares are helping maintain the illusion that all is well with capitalism. The deflationary wind blowing in through the window suggests otherwise. 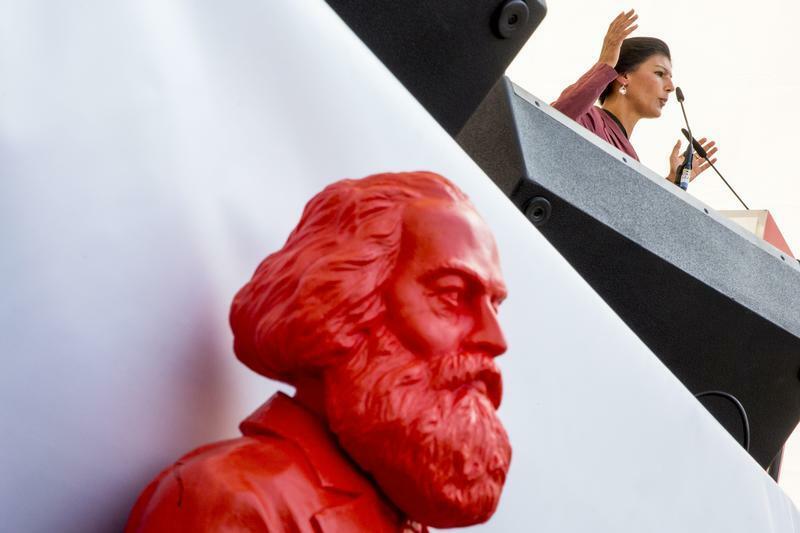 A plastic sculpture of philosopher Karl Marx stands in front of the stage as the top-candidate of the left-wing Die Linke party Sahra Wagenknecht speaks during an election campaign rally in Leipzig, August 28, 2013. The return on capital for U.S. non-financial businesses, measured as the ratio of their net operating surpluses to non-financial assets, was 10.8 percent in the first quarter of 2013, according to data from the Bureau of Economic Analysis. The return, also known as the rate of profit, has fluctuated between 6.4 percent and 13 percent since 1960.